Sunset on Sunday (2 October) marks one of the holiest days of the Jewish year, Rosh Hashanah. Literally translated Rosh Hashanah means "Head of the Year". It's the Jewish New Year and the first of the High Holy Days. Millions of Jews will take part in the two-day celebration, which begins on the first day of the month of Tishrei. During these special days, families will gather for meals to celebrate the time of rebirth and enjoy a feast of traditional sweet, salty and savoury foods. The foods all evoke blessings for the months ahead. Before the meal, there will be a recitation of Hamotzi, the blessing over bread. Apples and honey feature heavily in Rosh Hashanah meals, as they are said to ensure a sweet new year. According to Jewish mythology, the apple represents the Shekhinah – the feminine aspect of God – and eating the combination is said to encourage Shekhinah to be kindly when judging. Eating apples and honey began as a late medieval Ashkenazi tradition that is now universally accepted. In the video you see the reference to the fishes head.....so that they remember that they are the head and not the tail. Now there IS reference to Torah here in Deuteronomy 28, where it lays out the blessings and the curses.....BUT the spirit behind it is an Ashkenazy drive that is a bit like the aristocratic value system that the characters in Downton TV series often embody. A gritting of the teeth when anything comes in the way of their standing, and their position as top dogs....even if (for pragmaticisms sake!!!!) the truth must be bent a little. Jesus demonstrated TRUE HEADSHIP for all time being prepared to be murdered rather than push His own agenda, and entrust everything in His Life to God's Promises to fulfil anything concernng Him. The self for others spirit is the true LORDSHIP of the Universe. The Ashkenazy spirit, so different from the original Semite Torah history, claims headship as Divine right regardless. This spirit as I mentioned earlier is the same Triumphalism as the Muslim takeover Plan, and the Jesuit Takeover Plan, and the "unbroken Saulish" takeover plan of even the charismatics , who characteristically stood behind both Bush generations in their slaughters in the middle east. Rosh Hashanah meals usually include apples dipped in honey to symbolize a sweet new year. Other foods with a symbolic meaning may be served, depending on local minhag("custom"), such as the head of a fish (to symbolize the prayer "let us be the head and not the tail"). 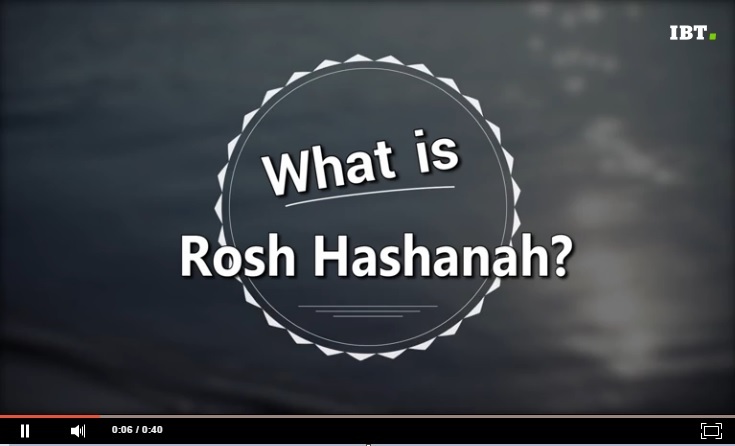 The Hebrew common greeting on Rosh Hashanah is Shanah Tovah (Hebrew: שנה טובה‎‎) (pronounced [ʃaˈna toˈva]), which translated from Hebrew means "[have] a good year".Often Shanah Tovah Umetukah (Hebrew: שנה טובה ומתוקה‎‎), meaning "A Good and Sweet Year", is used. In Yiddish the greeting is אַ גוט יאָר "a gut yor" ("a good year") or אַ גוט געבענטשט יאָר "a gut gebentsht yor" ("a good blessed year"). The formal Sephardic greeting is Tizku Leshanim Rabbot ("may you merit many years"), to which the answer isNe'imot VeTovot ("pleasant and good ones"). Less formally, people wish each other "many years" in the local language. A more formal greeting commonly used among religiously observant Jews is Ketivah VaChatimah Tovah (Hebrew: כְּתִיבָה וַחֲתִימָה טוֹבָה‎‎), which translates as "A good inscription and sealing [in the Book of Life]", or L'shanah tovah tikatevu v'tichatemu meaning "May you be inscribed and sealed for a good year". After Rosh Hashanah ends, the greeting is changed to G’mar chatimah tovah (Hebrew: גמר חתימה טובה‎‎) meaning "A good final sealing", until Yom Kippur. After Yom Kippur is over, until Hoshana Rabbah, asSukkot ends, the greeting is Gmar Tov (Hebrew: גְּמָר טוֹב‎‎), "a good conclusion". So the Ashkenazi Jews have changed things and added things according to the traditions of Babylon. The start of the year is NOT as laid down in the Torah, with very simple month names: ie the first month the second month etc. It's Rosh Hashanah today , but not having been to Israel and only having Christian versions of Torah this is all meaningless until you actually meet some.Jews here in the UK. It has , apparently the same minefield qualities as wishing somebody happy Christmas. Both are Babylonian. There is.what is commonly practiced, and then there is what God actually spoke.face to face to Moses. 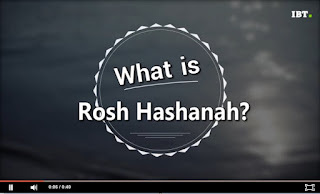 Rosh Hashanah is the Babylonian Talmud phrase. Feast of Trumpets is what English speakers know, which among Christians, is either meaningless.....Or if you are.charismatic.speaks of all the promises yet to come shovelled into a rapture, or else you are.Like us , believing we are in a current state.of.Feast of Trumpets announcing the Holy Spirit work of.bringing His people into the third level or third feast of tabernacles experientially ........something that is as irritating to Jews and most Christians......as Jesus actual fulfilment of.Passover was to His Jewish nation. They killed Him.......thus fulfilling Isaiah 53 down to the letter. Basically God stuff is ok as long as you don't say it is here and now........words like......this scripture is now fulfilled in your midst. NO THE KINGDOM IS NEAR US EVEN IN OUR MOUTHS. We are those trumpets this very day on Facebook. On this Jewish day of Feast of Trumpets it isn't the distant God of the Israelis speaking but the Emmanuel voice of Jesus who wasn't recognised by His own and it now seems by most of the church either, as He drops into my mind a picture of what we are doing wrong . Think of mixing a whole variety of ingredients in a recipe. Say a complex cake. We have put in two or three ingredients and are proudly mixing them to the nth degree when really we should be doing only a cursory mix with those .... But not overkill because we have 8 or 9 ingredients we haven't even touched yet , to mix in. Churches are all doing overkill in their denominational liturgies and highly trained choirs but haven't led their congregations through into the simplest of John 3 born again experiences yet. Evangelicals are doing overkill in the meaning of every last floorboard in the tabernacle but they haven't even been baptised in the Spirit yet so have know clue really how Spirit living works and yet they are trying to cross every last t and dot every i in their treatment of the Bible like a how to manual ..... Except everything they don't like.... Like miracle faith, they declare finished . Well learn off Torben Sondergrund or people here in Facebook. Charismatics are trying to achieve the perfect meeting with extraordinary lavishings of the power of God .... But it's all overkill because half the ingredients are still missing in the cake mix. But Chris what can they be? Jesus is saying you forgot the other 7 billion people, all their cultural identities and wisdom ..... And this is not their pagan demon stuff. ..... No this is their authentic God worked history of survival and skills and insights most of which are nowhere near in the Body of Christ yet . God is leavening the whole earth. Nobody stays in infant school until everything is absolutely perfect.... You move schools with age knowing you have enough under your belt for the next stage. Jews continue with their outer court religion for millennia thinking they have to burnish it like a new pin. They hadn't even finished when Jesus came. Did Jesus care? No He said Follow Me..... Wherever you are now and I will take you to the next stage . We can burnish pins for everlasting.... But part of perfection comes precisely when the whole house is present..... So leave your overkill and get into the holy place revelations followed by the Holiest place revelations...... For which we need the WHOLE HOUSE PRESENT!!!!!!! All the ingredients in the bowl. THEN SHALL THE CAKE RISE!!!!! !